The Bank of Japan (BOJ) is expected to conduct its monetary policy meeting between July 28–29, 2016. On May 31, 2016, Japan reported a consumer price inflation rate of -0.40 percent and the BOJ Governor Haruhiko Kuroda is aiming to avoid a deflationary downturn. 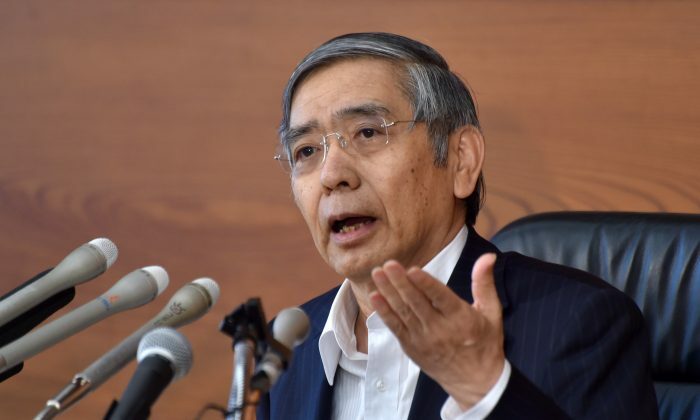 There has been ongoing speculation that Japan may implement helicopter drops to spark economic growth, which was primarily due to former Federal Reserve Chairman Ben Bernanke’s visit to Japan in July 2016 when he may have discussed helicopter money with Japanese officials. Helicopter Ben proposed the idea of perpetual bonds and helicopter drops during his visit in April 2016 to Prime Minister Shinzo Abe’s adviser Etsuro Honda. The speculation of helicopter money being implemented in Japan pushed the Nikkei 225 Stock Average from a low of 22,583.66 in June 2016 to 25,154.11 on July 22, 2016, an 11.38 percent increase. Additionally, the USD/JPY hit a high of 110.83 during over that period. The idea of helicopter money being distributed to the general public was first discussed by famed Nobel prize winning economist Milton Friedman in his publication “The Optimum Quantity of Money” in the 1960s. In the paper, Friedman outlined that central banks could stave off deflation and spur economic growth by directly distributing money to individuals within an economy with base money. This would theoretically cause the public to increase consumer spending and increase inflation. Helicopter money, also known as helicopter drops, could serve as an alternative monetary policy tool to quantitative easing (QE), which has been implemented in Japan since 2013. The BOJ has been approaching its limit of the amount of government bonds that could be purchased. In theory, helicopter drops could be used to stimulate the economy in times of low or negative interest rates, deflation, and economic weakness, when economic tools such as QE are ineffective. The BOJ has a target of Japanese government bond purchases amounting to $80 trillion yen, or over $700 billion, annually, in an attempt to deter deflation. The bond purchases are over double the Japanese Ministry of Finance’s expected new bond issuances. Despite its massive QE program, Japan has still struggled with deflation and has lowered interest rates in the negative territory. Japan’s consumer price YOY inflation rate fell by 0.10 percent in March, 0.30 percent in April and 0.40 percent, three straight months of declines. Japan’s radical move to enter into a negative interest rate environment is another tool that it is testing to stimulate consumer consumption and investments. However, these tools have not taken Japan out of negative inflation territory. QE’s ineffectiveness to stimulate the economy brought about the speculation of helicopter money, which caused the Japanese markets to rise on the hopes that this policy would be implemented. Is Helicopter Money Possible in Japan? The release of this statement caused the optimism of the adoption of helicopter money to diminish. Consequently, the Nikkei 225 Stock Average to fall by 1.10 percent and the USD/JPY slid by nearly 1 percent to 105.81. Helicopter money may be the last resort for Japan to increase its inflation and economic growth. If Japan wants to implement helicopter drops, also known as QE for the people, the Japanese government would need to change the law that prevents the BOJ to underwrite government debt, which may be ruled out for some time, especially before the monetary policy meeting in late July 2016. Market participants who wish to gain long exposure to the Japanese equity market before the BOJ meeting may want to consider the iShares MSCI Japan ETF (EWJ), which provides exposure large and mid-cap stocks that trade primarily on the Tokyo Stock Exchange. However, investors should note that investing EWJ before the BOJ’s policy meeting on July 28–29, 2016 is a high risk investment and it may experience a high degree of volatility. EWJ closed at $11.85 on July 22, 2016, over 15 percent off its 52-week low. EWJ remained nearly stagnant between June 2016 and July 22, 2016 due to the uncertainty of the BOJ’s monetary policy decision. At the time of this writing, the ATM weekly straddle in EWJ was implying about 3 percent move. Nikolai Kuznetsov is a financial writer and consultant experienced in stock market analysis and investment research. His website is NikolaiKnows.comand his Twitter is @NikolaiKuznets.